Stand up. It’s time for the Hallelujuh Chorus. My red peony opened its golf ball sized buds and has huge blooms five inches in diameter. My ears are ringing with the joyful music of Handel's Messiah. Anything that survives Flagstaff's winter and spring deserves a celebration. 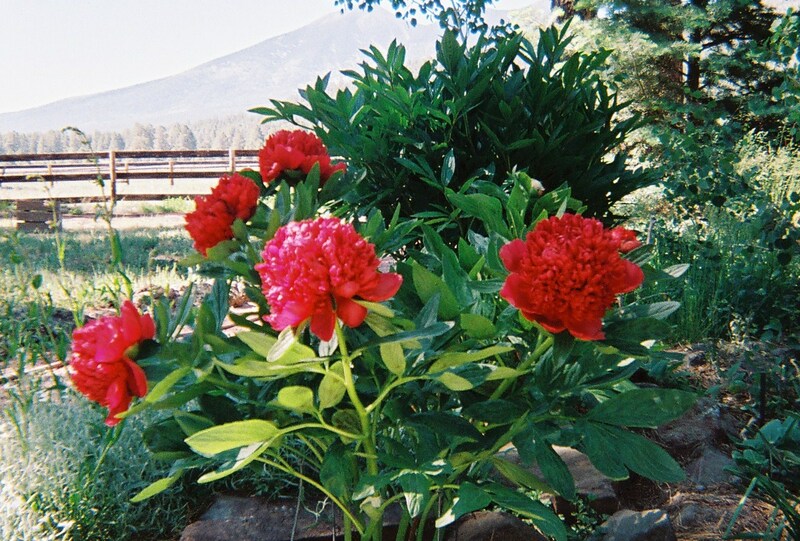 I’ve been a passionate gardener in Flagstaff for over thirty-five-years. I grew up in northern Ohio where everything grows. I learned to love gardening from my Polish family. Ohio sweet corn is the best. Delicious tomatoes grow there. My father taught my siblings and me to plant over one hundred trees around our home on 18 acres. The Colorado blue spruce and deciduous trees grew to be over fifty feet tall. We created a forest. Our fruit trees bore fruit. My mother had azaleas, and my grandparents grew a huge vegetable garden without elk. Flagstaff proved to be a challenge. But I couldn’t stop growing things. My husband's parents moved to Arizona about twenty years ago. My mother-in-law, Irene, presented me with a special gift, her beloved pink peony. It wouldn’t grow in Sun City. Peonies require a winter climate to satisfy dormancy requirements. Ah Ha! Maybe it would be happy in Flagstaff. Irene's peony is now fifty years old. It has given me spectacular pink blossoms with a subtle fragrance. It didn’t have ants on it this year so no blooms. 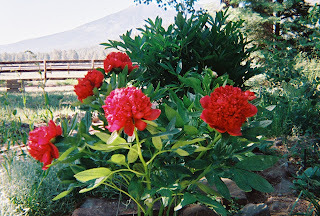 But my younger red peony had ants on it so it had beautiful blooms. The ants are a controversy. Some people say they have nothing to do with peonies blossoming, but I’ve watched them now for many years and believe the ants are important. The resident elk and deer in my neighborhood leave the peonies alone. What delightful news! Peonies need well-draining, amended soil, and abundant sunshine. They appreciate spring moisture. And they don't mind the altitude. I live north of town at a higher elevation. Peonies prefer slightly acidic to neutral pH soil. Perennials need a little extra preparation when planting, but the rewards are worth it. They can live to be 100 years old. They truly become a member of the family. They don’t like to be crowded. Prepare the planting site by digging two feet wide by one and a half feet deep holes. Space the plants three to four feet apart. They can grow to be three to four feet high. Fill the hole with one foot of good loam. Plant the rootstock so that the crown is two inches below the soil level with the eyes (sprouts) pointing upwards. Carefully shovel in loose soil around the rootstock. Water well. They won't bloom if planted too deep or in the shade. Once established, they only need water once a week. Before they bloom, I use a wire form around them so they do not fall from the heavy blooms. In the fall, I cut down the stalks to about two or three inches. I don't use the stalks for mulch. I weed them by hand so as not to disturb the roots. Prepare them for winter by mulching with our abundant pine needles or clean straw. The peony foliage is dark green and very attractive in the garden. Let the foliage thrive all summer for blooms next year. I feed them when I remember with a blooming plant food. I use Ferti-lome or Miracle-Gro. The blooms are great for cutting arrangements. Peonies come in a variety of colors to suit every taste. Once they are mature, they can be divided. but they prefer to stay in one place. Years ago, I moved Irene's peony, and it wasn't too upset. This May's freezing temperatures prompted me to cover my two peonies. I used quilt batting from the local fabric store. The ants seemed to appreciate their nightly blankets. My dear Irene is no longer with us, but her amazing peony lives on. I’m grateful for all those who’ve gone before me and taught me the love of gardening. Gardening is truly good for the soul. Puka Lewicky is a veteran gardener in Flagstaff. The photograph is courtesy of Puka Lewicky. Dana Prom Smith, editor of GARDENING ETCETERA, Arizona Daily Sun, can be emailed at stpauls@npgcable.com.